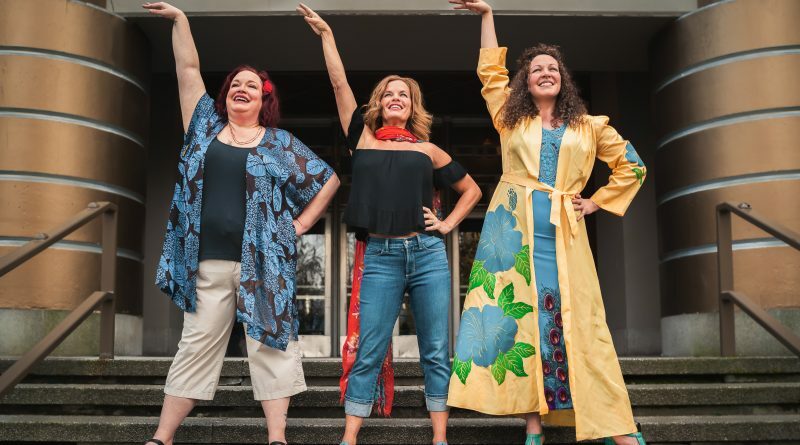 Seattle Musical Theater gives us Mamma Mia!, the musical with ABBA songs and a book by Catherine Johnson, running March 29 through April 14. Director Hattie Claire Andres took some questions. NWMS: Are you from Seattle? If not, where did you grow up and when did you arrive here? Hattie Claire Andres: I am a proud Seattlite! I’ve lived here my whole life–except for a five year stint in Minnesota for college and the year following it. I grew up in Ballard in the ‘90s and ‘00s–before it was trendy; back when the only cool thing about it was being close to Golden Garden’s Beach in the summer. NWMS: What are your most crucial memories from growing up? Which performers, shows, movies, albums, and songs, made you want to do musical theater? Hattie Claire Andres: My dad is a musician and both of my parents participated in theatre and dance so I was exposed to the arts early and often growing up. The first musical I remember seeing was in first grade. It was a production of Fiddler on the Roof that the middle school put on. I remember being so entranced with the production and then seeing the kid who played Tevya on the playground the next day. Seeing him out of character just a mere 24 hours later blew my mind. That was my first cognizant moment of the transformative power of theatre. My parents chose to not have a TV in the house growing up so my young exposure to musical theatre was through listening to cast recordings. The list of albums I listened to the most gives you a peek of my varied musical interests growing up, which has continued to inform my work as an adult: Annie, Annie Get Your Gun, Les Miserables, Phantom of the Opera, Pippin, Rent, Company, Dreamgirls, and In the Heights were favorites throughout the years. NWMS: How has Seattle grown changed over the years you’ve been here, musically, theatrically, and otherwise? Hattie Claire Andres: It’s been a really special experience to have a professional career in the place where I trained and grew up. Seattle Children’s Theatre was my main home as a child. I also participated in the 5th Avenue’s early education programs. Now I get to teach and direct at those theaters. I’ve witnessed the ebb and flow of Seattle’s theatre ecosystem over the years: Intiman closing and rebuilding, Balagan from start to finish, ArtsWest’s re-emergence, Washington Ensemble Theatre’s move into the beautiful 12th Avenue Arts building, to name a few. I definitely feel a deep sense of pressure on artists from the quick rise in cost of living here. I told my own sister not to move back here if she wanted a career in the arts out of college and to be able to afford rent. I remain hopeful that the innovative arts leaders in this town will find a way to connect with the new tech community on a broad scale. What could be a better antidote to sitting at a computer all day than a communal experience of live theatre? 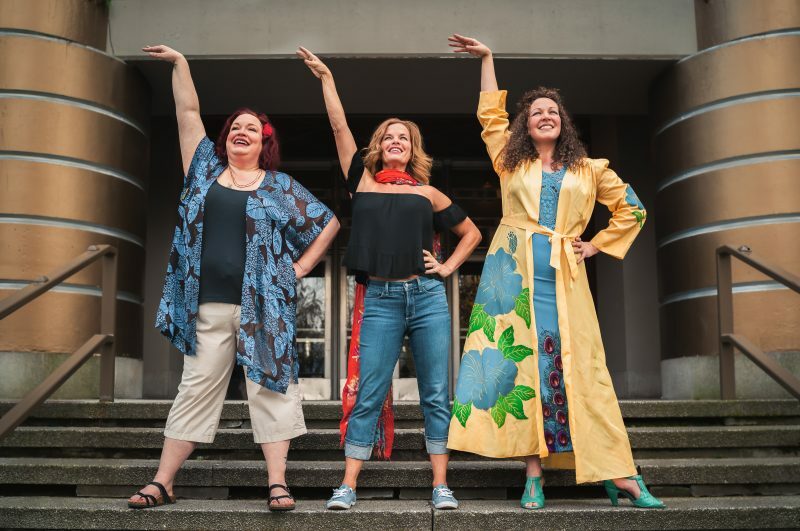 NWMS: What lead to your job at Seattle Musical Theatre? Hattie Claire Andres: As with many directors, I entered theater as an actor, which was my main focus through college. I began producing in high school as a founder of the Young Americans’ Theatre Company and directed a self-produced musical as my senior project. The act of producing and directing was extremely satisfying–I got to put my leadership skills to use and got to make projects happen, rather than waiting for someone to cast me. NWMS: What were your earliest experiences hearing ABBA? Hattie Claire Andres: My first exposure to ABBA was through the A*Teens doing “Halfway Round the World” and “Upside Down” on Radio Disney. I just Googled the A*Teens and read an article referencing them as “the band who brought ABBA to a new generation.” As for the original songs, well, I remember being at a choir conference in 4th grade and learning the “Dancing Queen” dance and just thinking that life couldn’t get much better than that. NWMS: What are your all-time favorite ABBA songs, and why? Hattie Claire Andres: I love “Super Trouper” for how it moves seamlessly between fluid, romantic verses into a boppy, catchy chorus. The song that has surprised me the most working on the show has been “One of Us”–it’s incredibly beautiful and heartbreaking and Lisa Mandelkorn (Donna) is giving ABBA a run for their money with her interpretation of it. NWMS: How did you go about assembling the cast for “Mamma Mia”? 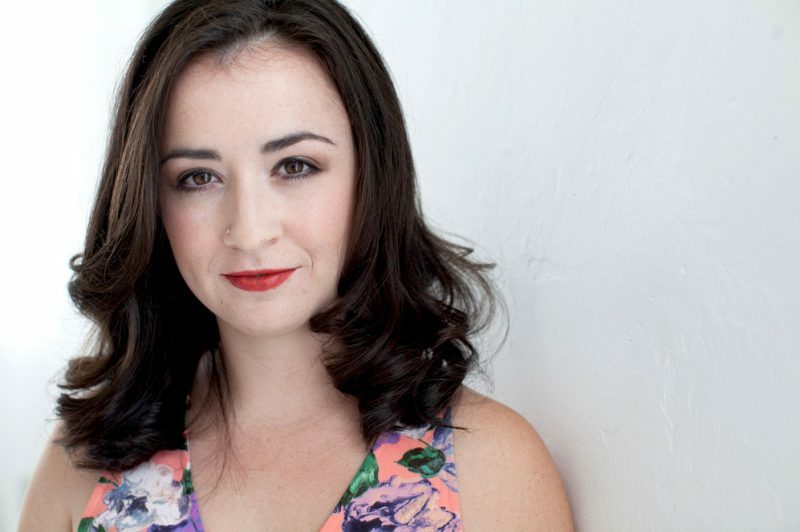 Hattie Claire Andres: Casting this production was an exciting challenge for myself, Alex Crozier (choreographer), and Steven Tran (music director). My audition experiences had mostly been with union theatres (5th Avenue, Seattle Rep, Village) but SMT is a non-union house. The Mamma Mia! auditions were a wonderful opportunity to meet new faces and see people I hadn’t met. Alex, Steven and I had a vision of what we were looking for, so the decision making process was incredibly smooth. Representation is high priority for the three of us and we are thrilled to have a diverse cast. Equally important to us is a solid work ethic and mutual respect. It’s like putting a puzzle together; we found actors who have good chemistry with each other–both romantic and platonic –and a balanced ensemble with strong vocals and dance abilities. There are so many incredibly young and talented musical theatre performers in the Seattle area; we could have easily cast an ensemble three times as big, given the talent that we saw. NWMS: How did “Mamma Mia!’s honchos go about inserting ABBA songs into a narrative? What are the major challenges in putting on the production? Hattie Claire Andres: What I appreciate about Mamma Mia! is the substantial plot; it stands on its own even without the music. In rehearsals we talk about the different ways music is used in the show: as performance (“Super Trouper”), as dramatic climax of the plot (“The Winner Takes It All), as a sneak peek into a character’s brain (“Mamma Mia”), and sometimes as a bizarre nightmare sequence (“Under Attack”). A unique challenge for this production is that it incorporates the ensemble singing, often when the ensemble is not onstage. This is a huge logistical challenge for sound design and backstage traffic. The actors rarely relax for more than two minutes. NWMS: What were the toughest aspects of the production, and how did you work through them? Hattie Claire Andres: Mamma Mia is a huge show. SMT operates with a small but dedicated production staff. The sheer workload with limited resources has been incredibly challenging. I remain focused on the three things my team can fully control: organization, communication, and follow through. Those things are happening and we are putting ourselves on track to take this production to new heights of SMT standards. NWMS: What are your plans for after this show? Hattie Claire Andres: I have finally learned that I need two days off to recover after opening a show. Part of that is the physical exhaustion and part of that is emotional–opening a show is like giving birth to a creative act. I’m the Artistic Associate full time at Seattle Rep, so my first plan is to dig into my inbox and catch up with my co-workers. Looking towards summer: I’m thrilled to return for my second year as Program Director of the Young Actor Institute, Seattle Children’s Theatre’s high school summer acting intensive. Then I’ll be associate directing Seattle Rep’s musical adaptation of As You Like It through our Public Works program, which is my absolute favorite program to work for in this city. Oh, and I’ll be attending a lot of weddings. Although I’m sure none of them will be as exciting as the one in Mamma Mia! Purchase tickets and get more show information HERE.